I recently spent 8 days in the southern part of the Okanagan Valley in British Columbia. I hadn’t visited the region for some ten years and I am pleased to see the progress made in the period since my last visit. 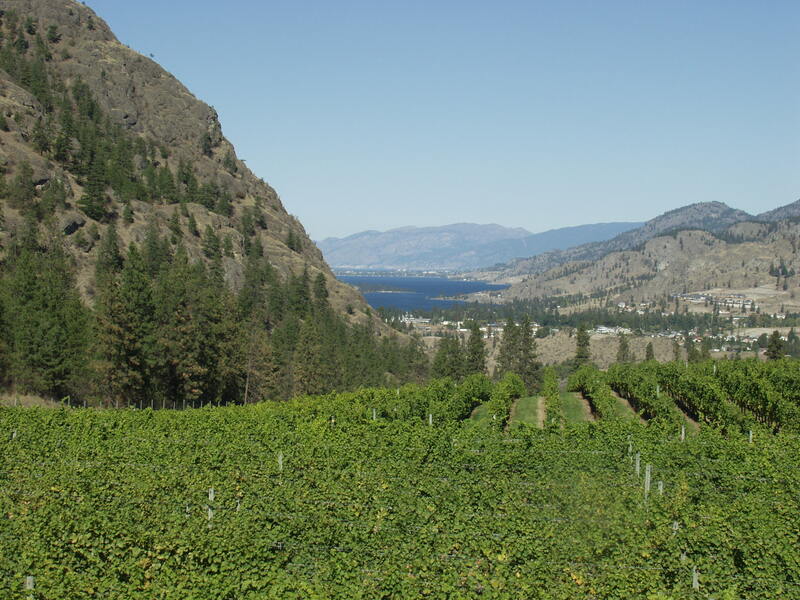 In a young wine region such as the Okanagan ten years is a long time and it is evident the grape growers and winemakers of the region have used the time well. With advice from some local wine pundits I was able to be selective in the wineries I visited. I covered well-known big-names and a handful of smaller names to get a reading on style, quality and people. I am surprised to report every wine was a delight – by this I mean these were good wines that would stand up to a judge’s scrutiny, tasted blind or otherwise. conditions that generally present little frost damage exposure. Stunning vistas and gently-sloping terrain with the right aspect add further to the winning environmental formula of the Okanagan Valley. There is no doubt the Okanagan is blessed in ways that Niagara and Prince Edward County producers must envy, but the environment is not the whole story. The grape growers and winemakers of the Okanagan have figured out how to combine the right grapes, grown in the right places with winemaking that brings out the best of the terroir and puts it in the bottle. At this moment it is hard to identify the grape varieties that one could call Okanagan regional champions. In Niagara Riesling, Pinot Noir and Chardonnay are emerging as the varieties with the best characteristics for long-term regional success. In the Okanagan I tasted excellent wines made with everything from Cabernet Sauvignon to Pinot Gris, from Syrah to Chenin Blanc. The region is physically big so there is plenty of climate variation enabling a diverse range of varieties to prosper. Something that stood out on all my tastings was the attention each winery devoted to the visitor experience. I was in town during the Fall Wine Festival so things were hopping with many tour buses and small group tours constantly following my path. The tasting rooms were attractive and welcoming, the staff were knowledgeable (Camelot was the exception – it was the day after the conclusion of the fall wine festival and among other things the cellar door had no red wines for tasting…this occasion was an exception to the Camelot rule, I suspect and I will check it out again on my next trip) and the hosts went out of their way to be hospitable to all guests. The tasting rooms were very busy and yet I was treated well everywhere and this has not always been the case in my travels over the years. Wine writers occupy a lot of host time, take up a lot of counter space for their notebooks, etc. and ask a lot of questions: we are a slow moving lot. This is why I always buy some wine when I do a professional tasting: it’s a small thank you for the time I took. The Okanagan Valley is remote from major population centres such as Vancouver or Calgary. This means that a prospective visitor has to make a commitment of time and money when they decide to visit the region. A three to five hour drive is required as is overnight accommodation and meals. The wineries of the Okanagan understand the commitment their visitors make when they take the journey and accordingly they recognize the importance of making that journey a positively memorable one for their guests. I believe a contributor to the acceptance BC wines have garnered in their home province and in Alberta is the visitor experience at the winery. This connection between a positive winery visit and the successful development of wine brands is something all wineries should take to heart. I will write more on this topic in the near future. The bottom line is the Okanagan winery experience was memorable and I will be returning soon to expand my coverage. In the meantime check The Wine Economist blog (link below) for two excellent recent articles on the Okanagan Valley. Originally published in WVN October 30, 2010. Copyright© W. John Switzer 2003 – 2010.